Ready to teach your children about the water cycle? This free water cycle poster and placemat from the U.S. Geological Survey can help! Available as a PDF, 11×17 image or a large poster image, the printable download explains the processes of evaporation, precipitation, and groundwater storage in a colorful and interesting way. 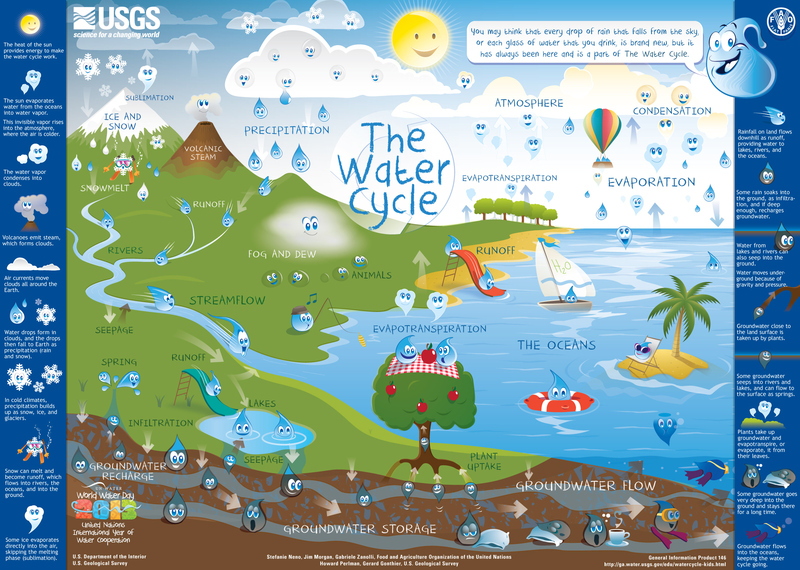 The water cycle poster makes a perfect addition to a science notebook! Fun (if brief) interactive that visually explains the process. 16-page lesson plan that includes great background information, two lab activities and worksheet for follow-up. 55-page download from Utah State University that includes four hands-on lessons and four activities. This is not a free resource. Hands of a Child makes wonderful lapbook units and, for those who want something more formal, this 50-page packet is highly rated. Includes 10-page research guide, 16 hands-on activities and an extension activity.